I'm very hopeful that some among those of us who reject the mythology imposed by our government's official telling of President Kennedy's assassination will be open to reassessing what we think we know if given reason to do so. Contemporary forensic sciences have produced revelations in the emerging applications of new methods and new technologies employed in modern crime scene reconstruction and analysis. Until recently I have chosen to keep many of the forensic aspects of the case at arms length. I agree with earlier statements to the effect that when experts disagree, we are disadvantaged in terms of lacking essential training and education to know whom to support. Some of it may ultimately rely upon intuition or instinct. What I have recently come to consider is my own slow realization that many of the most current advancements in forensic research represent new facts which may seem counter-intuitive to those who have no training in the related fields of newly emerging technologies and disciplines. I see all of the various stages of our 50 year journey from Dallas to the present as necessary steps in the long slow story of our originally blind struggle to move from darkness to light. I bear no resentment nor animosity towards those pioneers who simply did the best they could, based upon what was available at the time, to accurately assess and interpret "their facts." No one can blame the researchers and critics of the past who genuinely sought to understand questions which truly could not, at the time, have been answered. We're a long way from there now and we are still moving forward. Research developments in the mechanics of head wound ballistics, utilization of unbelievably high-speed photography, radial and concentric fracture sequencing studies of human skulls, symmetrical and asymmetrical beveling in relation to projectile directionality, related subjects of distinguishing back spatter from forward spatter and, perhaps most extraordinary of all, the news that current forensic research indicates the forward movement of President Kennedy's head (at Z-frame 313) followed by violent rearward movement is consistent with a single gunshot to the head from the front. Studies conducted by Karger (2008), Radford (2009), and Coupland (2011) prove initial transfer of energy causes the target to swell or move minutely into the force and against the line of fire. I once tried, I mean, I really tried to discuss some of this with a particularly stubborn person whose opinions of his own outdated, misinformed opinions rendered his cup to be too full to accommodate any new anything. He had everything he needed and was content to sit back and bask in the secure warmth that his certainty afforded him. I suspect that Progress is a train that does not wait for everybody, especially old fatheads, to climb on board before moving inexorably from the station. Hi Alan. Thanks to you, Karl, and of course Sherry for promoting this. I Guess I held onto the shot from behind the fence on the grassy knoll as long as anyone. I'm seeing more and more positive response from Sherry's research on the internet. Apparently a shot in the right temple would not have been possible from the grassy knoll. SLowly, but surely I have seen Sherry' s work adopted as a more reasonable trajectory. Can anyone show from where on the overpass such a shot would have come from? Is there any research on what went on there? Any witnesses to the goings on there? Hi Phil. Thank you so much for the information and links. I will check into those right away. I just read one of many positive reviews of Sherry's work. It had a great line "As a devoted Grassy knoller, I may have to hold on to the belief that someone there was shooting, but missed!" Like Kelly, I too have always considered it very likely that the kill shot was from the knoll...but if following the evidence means letting go of old cherished beliefs, I am ready to do so. The image below defines the possible trajectory for the one and only head shot. 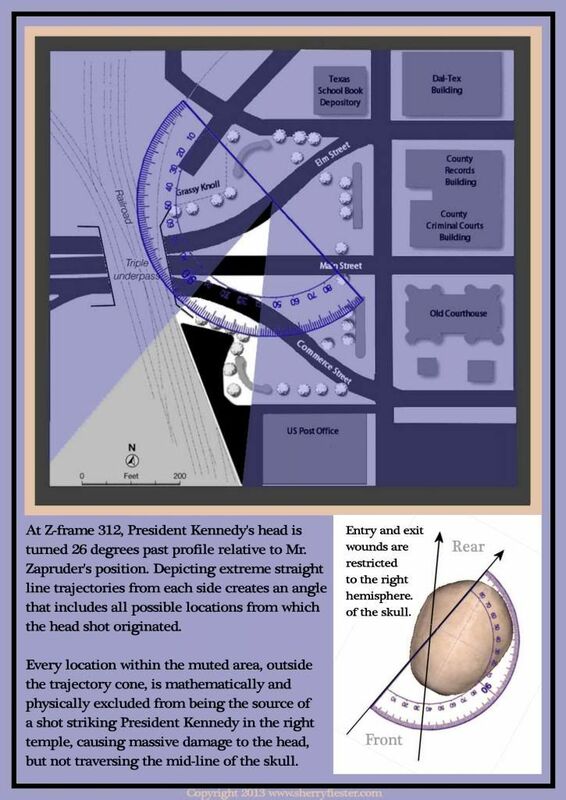 Remember that the position of the limo being perpendicular to Zapruder would place a shot from the north knoll to the side and not a frontal one. I still believe there was something going on behind the infamous fence. A missed shot? A diversionary piece of fireworks? Whatever it was, today I believe modern science has eliminated that location for the fatal head shot. Thank you, Phil. We are so fortunate to have you here! Here is a quote by echelon from another thread here: "Perhaps if someybody could prove to the public's general satisfaction that just one small but important piece of the official story is false, this might initiate a shift in the tectonic plates which would eventually lead to more politicians and/or media figures speaking out against the whole crumbling facade." I've been trying to shout it from the rooftops but seem to be wasting my effort on those who just won't take the time to read Sherry's book and become enlightened to the fact that more than one very important piece of the official story HAS been proved false. Believe me, I've been waiting for many decades for some kind of physical proof of conspiracy and have essentially used the same exact words as echelon. Phil, I know you remember how optimistic we were when I worked here in the studio on trying to correlate gunshot audio with Z film frames. Be assured that all the window dressing in "Enemy Of The Truth" aside, back spatter evidence, alone, not only proves one and only one headshot from the south knoll area but also that there were "at least" 2 shooters because Connally was hit from the rear, thus, we have a conspiracy. There are actually a couple of other corroborating facters that have been discovered throughout the three decades of lab trials since the discovery of back spatter. If echelon is sincere, it would behoove him to embrace the FACT that this is what lends legitimacy to any researcher's effort to unearth a "whodunnit." Do you really think the whereabouts of Oswald at the time of the shooting is as important as it used to seem to be? Well, I believe it would still be good to verify for other reasons but isn't it obvious that the profound revelation in "Enemy Of The Truth" causes one to view many other aspects of the case from a new perspective? Doesn't it render discussions on some subjects moot? Yellowbirch1 has long speculated that the throat shot came from the South Knoll area. In analyzing the trajectory we now realize that after the hairpin turn from Houston to Elm the limo is already facing that area almost head on already and continues to be positioned in that configuration as it makes its way to the point of the headshot. One significant point here is the down grade from the turn to the point of headshot. Although I'm not sure that a sniper would purposely take a shot through the windshield, it is certainly a fact that a sniper up on the South Knoll would not be elevated above the limo as much at the turn as he/she would be down at the position of the headshot where the trajectory easily makes it over the windshield. Fortunately, we have Z frames 312 - 313 as scientific proof of the origin of the headshot and that is corroborated by other evidence including some from the autopsy that we were lucky to discover hadn't been obfuscated, presumably due to lack of knowledge in the forensics of the time. Unfortunately, as Sherry has confirmed, we have no supporting physical proof of the throat wound's origin so we have to rely on puzzle pieces to speculate on. I can't help being redundant in quoting Mitch C. as his enlightenment has produced the best comment I've heard yet regarding "Enemy Of The Truth"
Thanks Phil and Karl. I am a great fan of Sherry`s work. She has hit the nail on the head in my opinion. Enemy of the Truth explains it all. What I was wanting to know was how to head reacted to the shot. Sherry spent a lot of time with me trying to explain it all and I`m not an easy person to understand such complicated information. Please get her book and give it a chance! A view from the Triple Underpass near the South Knoll. I don't think it would have been necessary (or wise) to shoot through the windshield. Thanks Phil and Karl. I am a great fan of Sherry`s work. She has hit the nail on the head in my opinion. Enemy of the Truth explains it all. What I was wanting to know was how the head reacted to the shot. Sherry spent a lot of time with me trying to explain it all and I`m not an easy person to understand such complicated information. Please get her book and give it a chance!